Gone Kesh is a good-natured coming-of-age tale, applauds Sukanya Verma. Losing hair may not be as extreme as losing eyesight, but its trauma can crush a person's self-confidence. Even if one isn't seduced by the idea of vanity or its burdens, it's natural to want to hold on to what one always had. Depressing as that may be, how long can a person focus on what's gone and allow society's set standards on beauty (or normal) to pull down one's morale? You are what you feel and not how you look is easier said than done in a world fixated on light complexion, size zero and Rapunzel's hair. It's tougher on young women given how a guy can be dark and handsome, bald and Bruce Willis. And yet to look into the mirror without someone else's expectation is, perhaps, the only way to fight it. 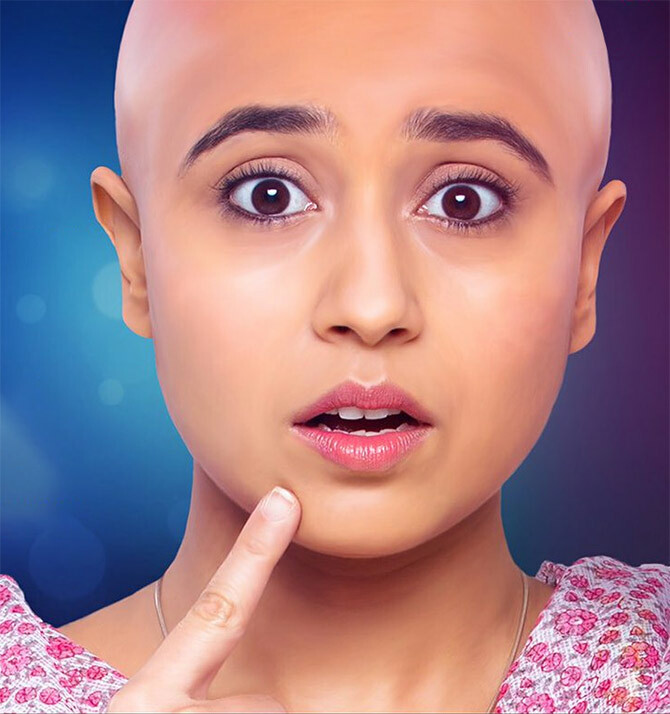 Written and directed by Qasim Khallow, Gone Kesh is a good-natured coming-of-age tale about a Siliguri girl diagnosed with alopecia leading to acute hair loss and baldness. 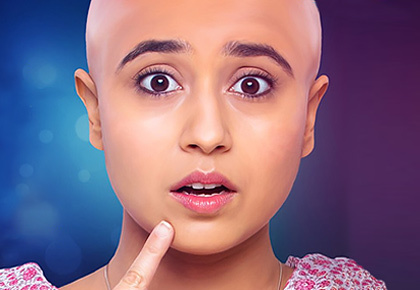 A constant feeling of embarrassment has turned Inakshi (Shweta Tripathi) somewhat evasive and cast a shadow on her effervescent spirit. The only thing that seems to light up her face is a dance competition at the local mall where she is employed as a salesperson of a cosmetic department. Dancing is her passion and Inakshi is keen to participate even if company rules do not allow. It's a minor setback for someone who has known worse. Through frequent flashbacks of her teenage years, we witness the harrowing time she has had at school. Classmates make fun of the growing 'brown island' on her scalp and tease her Gone Kesh, a cruel wordplay on 'gone case'. Her father is initially dismissive and even darkens the patch using a sketch pen. Her mother is distressed at the sight of clogged hair in the sink. Ignorant physicians attribute it to generic deficiency and prescribe a diet of fruits and milk. Another treats it as an infection and suggests cream and carrots. With masala out of her life and boiled eggs galore, Inakshi's glum face wonders what she did to deserve all this baldness and blandness. More than a social commentary though, Gone Kesh plays out like a personal account of a nightmarish decade in a young girl's life as her condition becomes detrimental to her daily life and dreams. Teenage is a tender time where even a jaw clip mocks and your best friend casually tying her tresses in a bun can be a painful reminder. What is nice is how director Khallow doesn't see this as an opportunity to turn the premise into a soppy melodrama. His approach is poignant yet pragmatic and sprinkled with just enough humour to allow an easy, amusing interaction among average, uncomplicated people. The happy-go-lucky inhabitants of Siliguri's cosy, close-knit ambience dream as humbly as they speak. Inakshi wants to dance in a modest mall contest. Her father wants to travel in a plane. Her mom wants to see the Taj Mahal. And the boy (Jeetu, a rather likeable lad), who secretly crushes on Inakshi since college simply wants to take her on a momos date at a stall named Wong Kar Wai. Despite the seriousness of the subject, Gone Kesh isn't gloomy fare. Much of its warm, affable mood comes from Inakshi’s affectionate parents, played by Vipin Sharma and Deepika Amin. Sharma is particularly remarkable as a simple shopkeeper and doting daddy vowing to get the best possible treatment for his daughter. Amin is a picture of motherly love and doesn't even have to try. Their effortless, authentic devotion to their unhappy child and Shweta Tripathi's gentle understanding of unwanted physical transformation are Gone Kesh's greatest strength. Though it is marvelous how she continues to pull off schoolgirl parts half her age movie after movie. It's a bit disappointing then how Gone Kesh dilutes its sweet, straightforward momentum for a predictable climax and amplified sentimentality. Still, what it is conveying holds good. Not all Rapunzels need hair to break free. Was Saif's debut as AMAZING as Sara's?